The NAVS found that the European Commission in its Sixth Statistical Report on the numbers of animals used in EU laboratories in 2008, showed the UK to be the biggest user of primates in Europe. The implementation of the revised EU Directive provides the new Coalition Government with the ideal opportunity to fulfil their pre-election commitment to decrease the use of animals. 8 September 2010: On this day the second reading of the Directive on the protection of animals used for scientific purposes took place. Tim Phillips, NAVS Campaigns Director said: “The public will share our disappointment that such an important opportunity to advance the replacement of animals in experiments has been missed”. Winter 2010: As we waited for the final votes on the text of the Directive, ADI began to prepare to move the campaign onto the next stage – implementation into UK law. Spring 2010: Following the bruising battle in the European Parliament, ADI continued to lobby and generate publicity and push for amendments during the toughest and least transparent stage of the process. 22 December 2009: Bacill, Baloo and Bacillusk, saved by ADI, were part of the primate supply trade. Their parents had been torn from the wild in Mauritius and were sold to Mazor Farm in Israel, who sold their offspring to the research facility that eventually handed them to ADI. 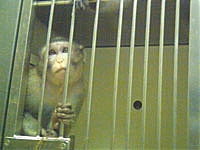 It was revealed on 2 December 2009 at a meeting of the European Parliament Agriculture and Rural Development Committee that a decision, which would seal the future of the millions of animals, used in laboratories was imminent.